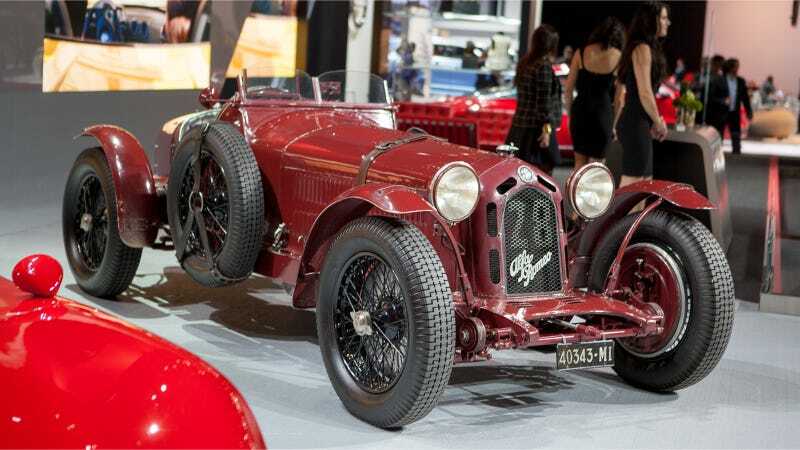 This Alfa Romeo 8C 2300 Monza is from the days when Ferrari didn't run Ferraris yet. Enzo Ferrari started out racing Alfa Romeo's beautiful machinery instead. In a room full of shiny concepts that will be disappointingly watered down for production and far too many woefully undriven cars, this Alfa's patina stands out like nothing else on the floor. This is a fender that's clearly seen some race time. Nothing about this car screams "show car," and the show is exponentially better for it. Speaking of vehicles that should not be shiny, Subaru brought several STis to the show, including the 2015 car that broke the lap record at the Isle of Man TT. The car had numerous nods to where it ran on its livery. Not to mention the obligatory row-o-sponsors. Alfa Romeo wasn't the only stand to bring a classic, either. BMW brought this lovely Alpina race car. Absolutely everything about this blast from the past is wonderful, from the color down to its condition. I'm glad to see the tires on this roundie were worn instead of shined-up for the show. This one had surprisingly thick race rubber for such a small car. Between the meaty, used rubber and the more modern looking window net, hopefully that means the car is still in use! I'd certainly love to spend some time in there. Who needs lights if you only race during the day? Lights are just extra weight. BMW's famous "Batmobile" has been popping up all over the place this year. The company is celebrating the fortieth anniversary of their first race win in North America, which happened in this 1975 3.0 CSL. The car was deemed the Batmobile for its wide arches and wild wings. Its interior is a bit more complex than the orange roundie's, but it's still somewhere I'd love to sit. Look at all those switches and buttons! BMW wanted to differentiate themselves enough so people stopped assuming that they were "British Motor Works" or something. I'd say the giant window banner made it pretty clear. BMW Team RLL's modern car with its tribute livery from Sebring was next to the Batmobile. They even had a 40-year decal on one of its many aero bits. I can see the family resemblance from this angle. Maybe less so from this one. Race car tech has come a long way. The new car is a tad shorter in height, too. Clearly, the three-colored stripes of BMW's M division have stood the test of time. Acura brought out their new endurance racer as well. This state-of-the-art ILX is destined for this year's 25 Hours of Thunderhill. Because this car will race through the night, it also featured the best set of headlights and light bars out of any of the race cars at the show. Clearly, this was the right car to stick directly in front of BMW's stand. Neener. The interior is perhaps the most complex of them all, complete with all the wiring hanging underneath the dashboard. The ILX's big, angled wing is certainly a sight to behold. McLaren brought a few of their track toys as well, including their new P1 GTR. If you want brakes the size of a large pizza, this is the car for you. If you thought the Acura had a cool wing, check this one out. The angled supports alone for it are sheer madness. Of course, even the track day cars have sponsor decals. Meanwhile, Toyota brought out a distinctly American race car for their display. It's labelled a Camry, but I don't quite believe it. This is far cooler than any Camry rental I've been stuck with! People like to think of NASCAR race cars as simple machines, but one glance in the window at the interior will tell you otherwise. Many of these components are made to be as light as possible. This Sprint Cup racer's row of obligatory sponsor decals was considerably more colorful than the Isle of Man Subaru's. Like the orange BMW, its fake headlights (and Camry snout, for that matter) are just for show. Mazda preferred red for its auto show lineup. One view of all the candy-apple curves on the side of its Lola-bodied racer should explain why. This is the prototype that they run in the Tudor United SportsCar Championship. These purpose-built racers always seem so tiny in person. Putting it on a platform of its own helped bring it closer to eye-level. Such a lightweight car only needs brakes the size of a small pizza to stop effectively. Next to the prototype was Mazda's latest generation of the Miata in race trim. Mazda is hoping to capture some of the same magic as programs like Porsche's successful GT3 Cup series with its new Global MX-5 Cup. Are these the saddest "please do not touch" stickers in the world? I think so. Everything about this car is begging to be touched! And hooned. And sent sideways. And hooned some more. Just in case you forgot what you were driving, Mazda spelled it out on the halos of the seats. Right now, the Global Cup car is just a concept, but hopefully we'll see customer versions go out soon. Last but not least, one of the McLaren Honda Formula One cars was on display. I love the glitter flakes in this livery as much as I hate how indistinguishable it is from the Force India cars this year. If the glittery bits were just unicorn fart purple or bass boat orange, it would solve all the issues I have with it. I demand more race cars with bass boat sparkles on principle, just to test this theory. The glitter really does look amazing in these close-ups. You can see the ripples of the vertical blinds at the bottom of the wing at the rear. Cool. Show cars are always a bizarre amalgamation of different years' Formula One cars by regulation, though, so it's hard to tell which features belong to which year's car unless that's something you follow intimately. That being said, it's not hard to get lost in all the curves, wings and intakes on an F1 racer from any year. Pssst, Honda. Use more of that radioactive green from the Civic next time. Force India's not doing that anymore, so it's fair game! I daresay the McLaren Honda puts any Civic's fartcan to shame, though. Look at all that glorious carbon fiber. Hopefully you enjoyed this view into the most interesting cars at the auto show. I can't wait to see them all racing somewhere. After all, that's what they're meant to do.